When it comes to restocking our beauty drawers, nothing feels better than getting a great deal on the products we love the most. In many cases, all it takes is getting a free gift along with the purchase of our favorite items. We’ve compiled a list of the top beauty brands that regularly offer free gift sets, and we’re keeping your budgets in mind. Now, we’re not talking about drugstore brands, these are department store and salon brands that won’t break the bank. In 1946, Estee Lauder invited her preferred customers to purchase her new product line at Saks Fifth Avenue, and with their purchase they would receive a free cream-based powder. The “free gift with purchase” marketing concept was born, and the rest is history. Luckily for us, Estee Lauder still offers regular free gift sets, with most department stores only requiring a $35 purchase. Their cosmetics range from approximately $20-$50 each, the skin creams and serums can range between $50-$100 and up, and the free gifts offered can be valued at over $100 for 5-8 deluxe sample sized items. So you won’t bust your wallet buying the Futurist Age-Resisting Broad Spectrum SPF 15 Makeup for $42, and if it comes with a 6 piece gift set, then it makes each item around $6 each. 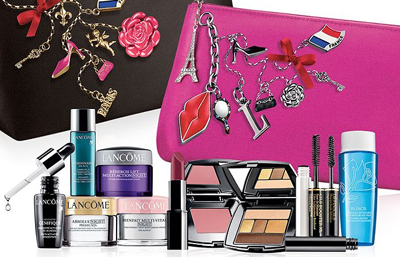 Lancome may not have invented the “free gift with purchase” concept, but they’ve definitely mastered it. 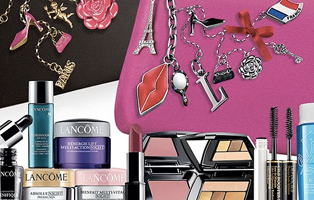 Like Estee Lauder, you can find Lancome free gift sets at most major department stores if your timing is right. However, if you miss out, they also offer deluxe free gifts directly from their website. You might be wondering, “Why would I buy the more expensive Lancome brand, when I can buy L’Oreal [the same company] for less money at the drug store?” I’ll start by acknowledging that the quality of Lancome’s products is similar to L’Oreal’s from what I’ve heard and researched. So both brands offer quality products. However, the drugstore will never offer free products with your purchase. 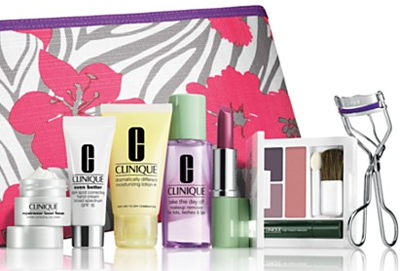 A recent Macy’s free gift set included an eye shadow palette, deluxe sample serum, full-sized lipstick, eye makeup remover, mascara, and cosmetics case, valued at over $116. It seems like an amazing deal for spending only $35 to qualify. So a 6-piece gift set, plus the purchased item, makes each item only $5 a piece. That’s potentially cheaper than buying the equivalent drugstore items individually. Clinique Bonus Time. Three of the sweetest words in the English language. Unlike Lancome and Estee Lauder, Clinique doesn’t offer as many star-studded free gifts around the year, which makes it such a coveted offer. 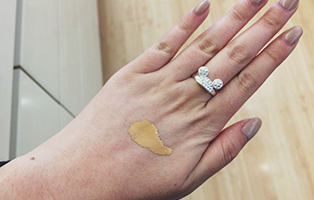 What makes it precious is the quality and value that Clinique provides. I’ve been using Clinique daily for the past 25 years, and have never had sticker shock at the counter. And my skin has never died of thirst. During Bonus Time season, I stock up on Dramatically Different Moisturizing Lotion+ ($26), Liquid Facial Soap ($17 for 6.7 oz. 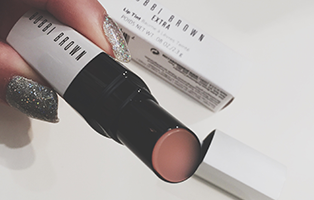 ), Instant Lift for Brows ($16.50), or any combination of the above that will qualify me for the free gift. Department stores will require anywhere from $27-$35 to qualify, but if the Bonus Time gift includes 8 items, it’s definitely worth the buy. So if I get the Liquid Facial Soap and Instant Lift for Brows, plus an 8-piece gift set, that makes each item about $3.35 each. Say what! Every month, Bliss Spa offers a new beauty-packed sample set on their website that includes an array of pampering products. So when you’re feeling like treating yourself, just know that Bliss will throw in a little extra something for you with your purchase (typically for spending $100 or more). And while investing in spa products might not seem money-wise to some, we do feel it is occasionally necessary, and keep in mind that Bliss Spa products are very affordable compared to most other high-end spa brands. Plus you can find a ton of everyday-use products, like the body washes ($18-$20) and body butters ($29), to stock up on. From what I’ve seen, the gift sets are typically well over $100 in value, so spending $100 to occasionally make yourself feel pampered shouldn’t feel overly indulgent when you’re getting $130 in additional products for free. And we agree. But taking care of our precious skin can come with expensive costs. 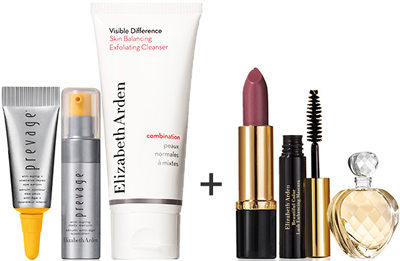 Our whole premise here is that women should celebrate their beauty — which falls directly in line with Elizabeth Arden‘s focus on their quality of products. And we’ve come across some spectacular gift sets that include their most popular products, which means we can celebrate our beauty with quality products, but also get more than what the retail price offers. If you find the skin care line to be too costly, focus on purchasing your favorite cosmetics during free gift season, when the free set includes their skin care products. We’ve seen a recent gift set that included the Prevage anti-aging serum, the Ceramide Capsules, and 4 other items. Together. In one free gift. The qualifying amount was only $45 — the gift set was worth $85. If you’re looking for affordable skin care or bath and body products, philosophy is a well-trusted source. You can typically find a rotation of free gift sets at most major department stores as well as on their own site. You just have to keep your eyes peeled. 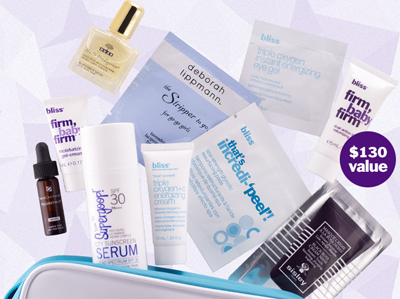 If you already use their award-wining purity facial cleanser, or the miracle worker eye repair, or the amazing grace body emulsion, chances are next time you need to stock up, you’ll be able to score a nice 4-6 piece free gift from one or more shops. We find that the benchmark is around $35+ to get the free gift set, so it’s really just an added bonus when buying your favorite products. 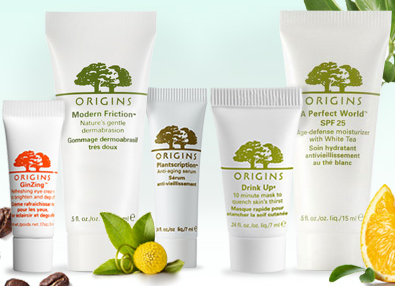 I love when I come across a great Origins free gift set, which is somewhat rare in the free gifts with purchase world. Stores will typically offer a single or duo free gift, but scoring a 3-5 deluxe sample set is worth the purchase when you’re in need of stocking up. I keep the Clear Improvement active charcoal mask ($25 for 3.4 oz.) and Checks and Balances face wash ($21.50 for 5 oz.) well-stocked when free gift time rolls around. The quality of their products is so amazing that when I get the free gifts, I ration them and use every single drop. Like Bliss Spa, I don’t buy from Origins on a super regular basis, but when the gift is good enough, I’ll spring the money. They don’t offer the larger gift sets on their site too often, so check their site and the department stores regularly for the best sets. 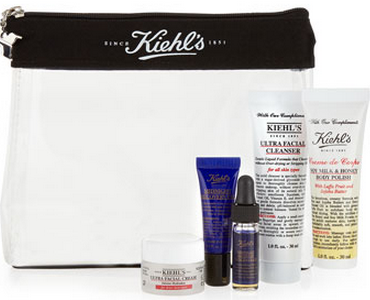 Kiehl’s is another really great brand that crosses between daily and luxury skin care for me. Yes, their products can be on the pricey side, but I’d recommend sticking with their best-sellers for affordable daily care. Their top-selling facial moisturizers and toners are actually fairly priced. And if you stock up all at once, you can occasionally find a 4-6 piece free gift set that includes a variety of their best products (cleansers, moisturizers, serums, etc. ), just be prepared to spend $75-$85 for your purchase. And if you’re gun-shy about trying out this line if it’s new to you, I’d recommend dropping by your nearest Nordstrom counter and asking the nice lady for a sample. They’ll pretty much sample any product for you, and send you home with a 1-2 week supply to test out. I love Nordstrom for this reason alone. What are your favorite brands that offer free gifts with purchase, and what are the best deals that you’ve bought in the past? We’d love to hear your thoughts! To keep up to date on all the latest deals that we can find for you, then submit your email below and get them sent directly to your inbox.